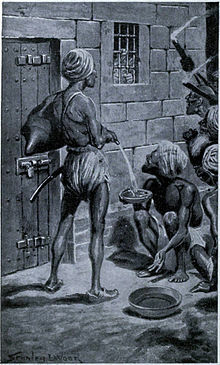 The Black Hole of Calcutta was a small prison or dungeon in Fort William where troops of Siraj ud-Daulah, the Nawab of Bengal, held British prisoners of war for three days on 20 June 1756. John Zephaniah Holwell, one of the British prisoners and an employee of the East India Company, said that, after the fall of Fort William, the surviving British soldiers, Anglo-Indian soldiers, and Indian civilians were imprisoned overnight in conditions so cramped that many people died from suffocation and heat exhaustion, and that 143 of 164 prisoners of war imprisoned there died. Fort William was established to protect the East India Company's trade in the city of Calcutta, the principal city of the Bengal Presidency. In 1756 India, there existed the possibility of imperial confrontation with military forces of the Kingdom of France, so the British reinforced the fort. Meanwhile, Siraj ud-Daulah, the ruler of Bengal, was unhappy with the Company's political interference in the internal affairs of his province; the British merchants were undermining his political power. As the Nawab, Siraj perceived a threat to Bengali independence and himself. He ordered the immediate cessation of the reinforcement of Fort William, but the Company paid no heed to the ruler's orders. In consequence to that British indifference to his authority, Siraj ud-Daulah organised his army and laid siege to Fort William. In an effort to survive the losing battle, the British commander ordered the surviving soldiers of the garrison to escape, yet left behind 146 soldiers under the civilian command of John Zephaniah Holwell, a senior bureaucrat of the East India Company, who had been a military surgeon in earlier life. Moreover, the desertions of allied Indian troops made ineffective the British defence of Fort William, which fell to the siege of Bengali forces on 20 June 1756. The surviving defenders who were captured and made prisoners of war numbered between 64 and 69, along with an unknown number of Anglo-Indian soldiers and civilians who earlier had been sheltered in Fort William. The English officers and merchants based in Kolkata were rounded up by the forces loyal to Siraj ud-Daulah and inserted into a dungeon known as the "Black Hole". The incident that took place was a direct violation of the human rights of the prisoners. Holwell wrote about the events that occurred after the fall of Fort William. He met with Siraj-ud-Daulah, who assured him: “On the word of a soldier; that no harm should come to us”. After seeking a place in the fort to confine the prisoners (including Holwell), at 8.00 p.m., the jailers locked the prisoners in the fort’s prison — “the black hole” in soldiers' slang — a small room that measured 4.30m. × 5.50 m (14 feet × 18 feet). The next morning, when the black hole was opened, at 6.00 a.m., only about 23 of the prisoners remained alive. The dungeon was a strongly barred room, and was not intended for the confinement of more than two or three men at a time. There were only two windows, and a projecting veranda outside, and thick iron bars within impeded the ventilation, while fires, raging in different parts of the fort, suggested an atmosphere of further oppressiveness. The prisoners were packed so tightly that the door was difficult to close. One of the soldiers stationed in the veranda was offered 1,000 rupees to have them removed to a larger room. He went away, but returned saying it was impossible. The bribe was then doubled, and he made a second attempt with a like result; the nawab was asleep, and no one dared wake him. By nine o'clock several had died, and many more were delirious. A frantic cry for water now became general, and one of the guards, more compassionate than his fellows, caused some [water] to be brought to the bars, where Mr. Holwell and two or three others received it in their hats, and passed it on to the men behind. In their impatience to secure it nearly all was spilt, and the little they drank seemed only to increase their thirst. Self-control was soon lost; those in remote parts of the room struggled to reach the window, and a fearful tumult ensued, in which the weakest were trampled or pressed to death. They raved, fought, prayed, blasphemed, and many then fell exhausted on the floor, where suffocation put an end to their torments. About 11 o'clock the prisoners began to drop off, fast. At length, at six in the morning, Siraj-ud-Daulah awoke, and ordered the door to be opened. Of the 146 only 23, including Mr. Holwell [from whose narrative, published in the Annual Register & The Gentleman's Magazine for 1758, this account is partly derived], remained alive, and they were either stupefied or raving. Fresh air soon revived them, and the commander was then taken before the nawab, who expressed no regret for what had occurred, and gave no other sign of sympathy than ordering the Englishman a chair and a glass of water. Notwithstanding this indifference, Mr. Holwell and some others acquit him of any intention of causing the catastrophe, and ascribe it to the malice of certain inferior officers, but many think this opinion unfounded. Afterwards, when the prison of Fort William was opened, the corpses of the dead men were thrown into a ditch. Moreover, as prisoners, Holwell and three other men were transferred to Murshidabad. The remaining survivors of the Black Hole of Calcutta were freed after the victory of a relief expedition commanded by Sir Robert Clive. After news of Calcutta's capture was received by the British in Madras in August 1756, Lieut. Col. Robert Clive was sent to retaliate against the Indians. With his troops and local Indian allies, Clive recaptured Calcutta in January 1757, and went on to defeat Siraj ud-Daulah at the Battle of Plassey, which resulted in Siraj being overthrown as Nawab of Bengal and killed. The Black Hole of Calcutta was later used as a warehouse. In memoriam of the dead, the British erected a 15-metre-high obelisk; it now is in the graveyard of (Anglican) St. John's Church, Calcutta. Holwell had erected a tablet on the site of the 'Black Hole' to commemorate the victims but, at some point before 1822 (the precise date is uncertain), it disappeared. Lord Curzon, on becoming Viceroy in 1899, noticed that there was nothing to mark the spot and commissioned a new monument, mentioning the prior existence of Holwell's; it was erected in 1901 at the corner of Dalhousie Square (now B. B. D. Bagh), which is said to be the site of the 'Black Hole'. At the apex of the Indian independence movement, the presence of this monument in Calcutta was turned into a nationalist cause célèbre. Nationalist leaders, including Subhas Chandra Bose, lobbied energetically for its removal. The Congress and the Muslim League joined forces in the anti-monument movement. As a result, Abdul Wasek Mia of Nawabganj thana, a student leader of that time, led the removal of the monument from Dalhousie Square in July 1940. The monument was re-erected in the graveyard of St John's Church, Calcutta, where it remains. The 'Black Hole' itself, being merely the guardroom in the old Fort William, disappeared shortly after the incident when the fort itself was taken down to be replaced by the new Fort William which still stands today in the Maidan to the south of B. B. D. Bagh. The precise location of that guardroom is in an alleyway between the General Post Office and the adjacent building to the north, in the north west corner of B.B.D. Bagh. The memorial tablet which was once on the wall of that building beside the GPO can now be found in the nearby postal museum. "List of the smothered in the Black Hole prison exclusive of sixty-nine, consisting of Dutch and British sergeants, corporals, soldiers, topazes, militia, whites, and Portuguese, (whose names I am unacquainted with), making on the whole one hundred and twenty-three persons." Of Counsel — E. Eyre, Esqr., Wm. Baillie, Esqr., the Rev. Jervas Bellamy. Gentlemen in the Service — Messrs. Jenks, Revely, Law, Coales, Valicourt, Jeb, Torriano, E. Page, S. Page, Grub, Street, Harod, P. Johnstone, Ballard, N. Drake, Carse, Knapton, Gosling, Bing, Dod, Dalrymple, V. Ament Theme. Military Captains — Clayton, Buchanan, Witherington. Lieutenants — Bishop, Ifays, Blagg, Simson, Bellamy. Ensigns – Paccard, Scot, Hastings, C. Wedderburn, Dumbleton. Sergeants, &c. — Sergeant-Major Abraham, Quartermaster Cartwright, Sergeant Bleau (these were sergeants of militia). Sea Captains — Hunt, Osburne, Purnell (survived the night; died on the morn), Messrs. Carey, Stephenson, Guy, Porter, W. Parker, Caulker, Bendall, Atkinson, Leech, &c., &c.
Messrs. Holwell, John Zephediah, Court, Secretary Cooke, Lushington, Burdett, Ensign Walcott, Mrs. Carey, Captain Mills, Captain Dickson, Mr. Moran, John Meadows, and twelve military and militia (blacks & whites). Thomas Pynchon refers to the Black Hole of Calcutta in the historical novel Mason & Dixon (1997). The character Charles Mason spends much time on Saint Helena with the astronomer Nevil Maskelyne, the brother-in-law of Lord Robert Clive of India; themes of colonialism and racism are discussed in relation to the event. Later in the story, Jeremiah Dixon visits New York City, and attends a secret "Broad-Way" production of the "musical drama", The Black Hole of Calcutta, or, the Peevish Wazir, "executed with such a fine respect for detail. . . ." Pynchon satirically refers to it in the long-running musical revue Oh! Calcutta!, which was played on Broadway for more than 7,000 performances. Edgar Allan Poe makes reference to the "stifling" of the prisoners in the introduction to "The Premature Burial" (1844). The Black Hole is mentioned in Looking Backward (1888) by Edward Bellamy as an example of the depravity of the past. In the science-fiction novel Omega: The Last Days of the World (1894), by Camille Flammarion, The Black Hole of Calcutta is mentioned for the suffocating properties of Carbonic-Oxide (Carbon Monoxide) upon the British soldiers imprisoned in that dungeon. Eugene O'Neill, in Long Day's Journey into Night, Act 4, Jamie says, "Can't expect us to live in the Black Hole of Calcutta." Patrick O'Brian in The Mauritius Command (1977) compared Jack Aubrey's house to the black hole of Calcutta "except that whereas the Hole was hot, dry, and airless", Aubrey's cottage "let in draughts from all sides." Diana Gabaldon mentions briefly the incident in her novel Lord John and the Private Matter (2003). The Black Hole is also compared with the evil miasma of Calcutta as a whole in Dan Simmons's novel The Song of Kali. Stephen King makes a reference to the Black Hole of Calcutta in his 2004 novel Song of Susannah. In Chapter V of "King Solomon´s Mines" (H.R. Haggard. 1885) the Black Hole of Calcutta is mentioned: "This gave us some slight shelter from the burning rays of the sun, but the atmosphere in that amateur grave can be better imagined than described. The Black Hole of Calcutta must have been a fool to it..."
In John Fante's novel "The Road to Los Angeles" (1985), the main character Arturo Bandini recalls when seeing his place of work: "I thought about the Black Hole of Calcutta." In "Vanity Fair" W. M. Thackeray makes a reference to the Black Hole of Calcutta when describing the Anglo-Indian district in London, (Chapter LX). In the period drama Turn: Washington's Spies, the character of John Graves Simcoe claims in Season 4 that he was born in India and that his father died in the Black Hole of Calcutta after being tortured. (In historical reality, Simcoe was born in England and his father died of pneumonia). In an episode of the Britcom Open All Hours Mr.Arkwright orders his assistant Granville to clean the outside window ledge. He attempts to say "There's enough dirt there to fill the Black Hole of Calcutta" but his extensive stuttering when trying to say 'Calcutta' causes him to change it to "There's enough dirt there to fill the Hanging Gardens of Babylon". In an episode of The Andy Griffith Show; S. 6 Ep. 11 The Cannon Deputy Warren is place in charge of security at the Mayberry Founders Day ceremony and he becomes obsessed with the town decorative cannon. He peers into the fuse breach and claims "It is darker than the Hole of Calcutta in there". According to Hong-Yee Chiu, a long-time astrophysicist at NASA, the Black Hole of Calcutta was the inspiration for the term black hole referring to regions of space-time resulting from the gravitational collapse of very heavy stars. He recalled hearing physicist Robert Dicke in the early 1960s compare such gravitationally collapsed objects to the infamous prison. ^ Little, J. H. (1916) ‘The Black Hole — The Question of Holwell's Veracity’ (1916) Bengal: Past and Present, vol. 12. pp. 136–171. ^ a b c d e Wolpert, Stanley (2009). A New History of India (8th ed.). New York, NY: Oxford UP. p. 185. ISBN 978-0-19-533756-3. ^ a b Holwell, John Zephaniah; Friends (1764). "A Genuine Narrative of the Deplorable Deaths of the English Gentlemen, and Others, who were suffocated in the Black-Hole in Fort-William, at Calcutta, in the Kingdom of Bengal; in the Night succeeding the 20th Day of June, 1756". India Tracts (2nd ed.). London, Great Britain: Becket & de Hondt. pp. 251–76. Retrieved 16 September 2011. ^ D. L. Prior, Holwell's biographer in the Oxford Dictionary of National Biography, reports figures of 64 prisoners and 21 survivors. ^ Pychon, Thomas, Mason & Dixon, pp. 562–564. ^ "The Works of Edgar Allan Poe, Volume 2". Retrieved 25 December 2015. Partha Chatterjee. The Black Hole of Empire: History of a Global Practice of Power. Princeton, N.J.: Princeton University Press, 2012. 425p. ISBN 9780691152004. Explores the incident itself and the history of using it to expand or critique British rule in India. Urs App (2010). The Birth of Orientalism. Philadelphia: University of Pennsylvania Press (ISBN 978-0-8122-4261-4); contains a 66-page chapter (pp. 297–362) on Holwell. Dalley, Jan (2006). The Black Hole: Money, Myth and Empire. London: Penguin Books. ISBN 0-670-91447-9. Wikimedia Commons has media related to Black Hole of Calcutta. Partha Chatterjee and Ayça Çubukçu, "Empire as a Practice of Power: Introduction," The Asia-Pacific Journal, Vol 10, Issue 41, No. 1, 9 October 2012. Interview with Chatterjee. Chisholm, Hugh, ed. (1911). "Calcutta" . Encyclopædia Britannica. 5 (11th ed.). Cambridge University Press. pp. 981–983.